Storing Tenaya on the "Hard"
Storing Tenaya on the hard (out of the water) for the hurricane season in the British Virgin Islands requires a number of projects to be completed. Here is our list of projects we needed to complete before she was stored for the season. 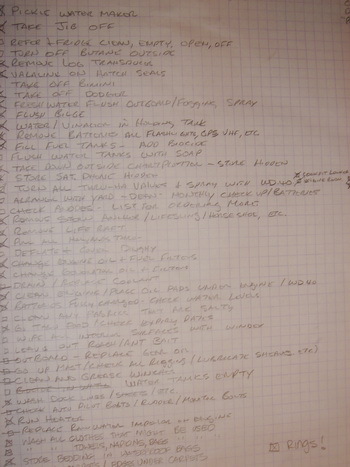 There is no order to the list, just things we added as we planned our haul-out. Remove batteries from all flashlights, GPS, VHF, etc. Go up mast and check all rigging/lubricate sheaves, etc. Wash all towels, napkins, rags, etc.